It snowed here today and it is supposed to go down to -22 degrees Celsius tonight ( -7.6 degrees Fahrenheit for my American friends). That is just not ok. I am absolutely longing for Spring. So in order to remind me that there IS sunshine SOMEWHERE here are the 13 places I would be happy to pack up my family, purchase travel medical insurance and get on a plane for. If I had money. Which I don't. But that is just not the point. 1. A Barbados vacation looks amazing to me! 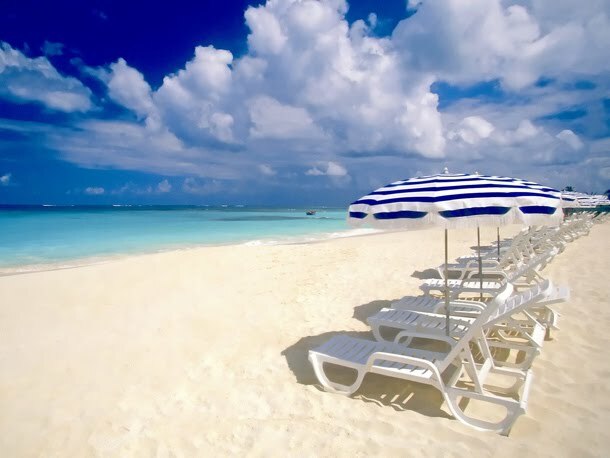 Barbados looks like the perfect place to avoid snow. 2. A luxury resort in Cancun would definitely serve the purpose. 3. An oceanfront villa in Maui looks delightful. I bet they don't get a lot of snow in Maui. 4. A spa in Arizona where they have real live orange trees with real live orange blossoms and NO SNOW. 5. Greece looks very appealing to me... I've said it before and I'll say it again... I think there must be some Greek blood in me somewhere because I am in love with that country and I've never even been there. 6. An all-inclusive resort in Fiji sounds perfect. 7. This site says that Aruba has perfect weather all year round so sign me up! 8. Many years ago (almost 11 now) when Doug and I were talking about where we would like to go on our honeymoon I thought the Bahamas sounded perfect... we never got to go there but I still think it sounds perfect. 9. 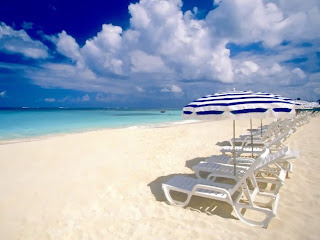 This site about Jamaica plays reggae music and is covered with pictures of gorgeous white sand beaches. Sold! 10. 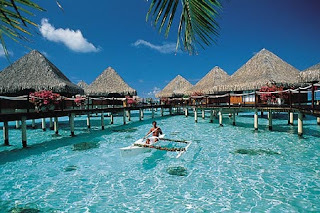 I have had many daydreams about visiting Tahiti... anywhere that has huts built out over the gorgeous tropical water is definitely a place I want to be. 11. The South of France just sounds delightfully romantic and according to this site it is a "sunny destination". 12. Costa Rica sounds exotic and I am almost certain they never have blizzards there. 13. This site claims that South Africa is one of the top 10 sunny destinations and since I already have a friend there bragging about how beautiful it is there and mocking those of us who haven't moved to South Africa that sounds like a good choice to me. Perhaps I can figure out a way to transport some of our snow to him so I can dump it over his head when I see him. No. I'm not jealous at all. Ok, maybe a little but he and his family are doing some amazing work over there so go check out The Seed of Hope. You may have noticed I am a wee bit obsessed with the IDEA of travelling to exotic locations... but that is only because I won't be travelling anywhere anytime soon and it is SNOWING here. It is vital to dream. Would you rather I talk about snow? Show pictures of our snow-covered trampoline and sandbox that my children can't play in? Ya. I didn't think so. So dream with me! All of them sound and look wonderful! I wouldn't mind a visit to any of them! I think a trip to Africa would be fascinating. Hopefully you'll make the trip one day. Happy T13! You have my sympathies on the snow. I live in VA where it doesn't snow so much and was never so glad to see the warm days and sunshine as I have been this year! Hope your weather turns warm very soon, since you can't fly away! Can I come with you? Those places looked great! I just moved to AZ and was amazed by all the orange trees. They are everywhere. I like walking down the streets in my neighborhood just to look at the orange trees. They look so pretty with all the ripe oranges hanging from them. Out of all those locations I've only been to a few. If anyone wants to send me to that resort in Barbados... I wouldn't be opposed!! WOW! That looks like the kind of luxury I could get used to! Well I live in the Australian desert, so snow sounds pretty good! We just took our girls to England when they had the freak storms over Christmas and thought snow was magical, but the cold did get to us. It's currently over 40 here. I love the look of your blog, the colours and flowers are gorgeous.